Highly recommend DFW Pressure Works did a fantastic job for us Mitchell’s professional does a great job would definitely recommend and hire again. – Charles P.
DFW really sets a high standard when it comes to performing quality work! If you are looking for different companies to service your home, stop now! DFW is incredibly great and has left me beyond satisfied! Mitchell is amazing and provides wonderful customer service through and through the entire experience. -Matthew T.
Always helping out in town by cleaning up graffiti and proving to be one of our great citizens. Thank you DFW Pressure washing! 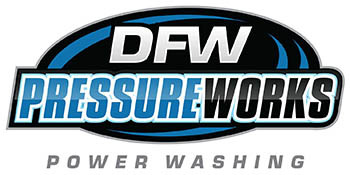 -Tim R.
I would highly recommend DFW Pressure Works! Mitchell did a great job. He provided excellent customer service through the entire experience. -J.D. S.
Had my fence done and it looks amazing! Very impressed with the outcome of this service! -Miah P.
If you need pressure washing services in the DFW area I highly recommend DFW Pressure Works. Phenomenal quality and Customer Service!! -Dustin F.
We recently used Dfw pressure works to do a house wash and power wash our back patio. They did an outstanding job and were very professional. House looks better than new. I would highly recommend this company! -Justin O. Had DFW Pressure Works come out to do my driveway and entryway at my house. They did an amazing job, very professional and timely. Loved the job they did so much we have recommended them to friends and family who have used them for their houses and even their boats. HIGHLY RECOMMEND!! -Brandon S.
Not only was I impressed on how good the job turned out but he was very professional. I would recommend him to anyone looking! -Chris P.
Mitchell is a very honest guy! It’s nice and refreshing to see a company that truly enjoys what they do. I highly recommend, and would definitely use again! -K. P.
Mitchell did a fantastic job, very honest and professional. Would definitely refer as well as use again. Thanks for a great job. -Charles P.
EXCELLENT SERVICE, HIGHLY RECOMMEND!! -Melissa N.
These guys are amazing. Mitchell is incredibly knowledgeable and trustworthy and his professionalism stands far above the status quo. I definitely recommend DFW Pressure Works! You WILL be happy! -Matt T.
DFW Pressure Works was GREAT! They came on very short notice and did a fantastic job. Thanks guys!! I will be calling them again. They where very professional. From there truck to there company clothing. Top notch outfit all the way around. -Branden K.
They did a great job on my house!! I had no idea my pool and patio could look so clean. Very pleased and would definitely recommend them. -Brandon O.
DFW Pressure Works arrived on time and did an excellent job cleaning our sidewalk, driveway AND garage. The garage was added at the last minute and I was not charged extra for that work as it was all covered under the minimum charge. I would would definitely use this company again. -Allen K.
They were professional from start to finish. I was very surprised on how timely they were able to get my properties cleaned for me. I would definitely say they are reliable, trustworthy and gentlemen. -Adriana W.
We hired DFW Pressure Works serviced my home, cleaning dirty siding and concrete, which was long overdue. From start to finish, their service was top-notch. They were very professional and responsive to my questions/concerns. I was explained the process, given a schedule service date. When DFW’s techs arrived, they were on time, professional, and courteous. I would definitely hire DFW Pressure Works again. I have already recommended them to family members. Thanks DFW for a job well done! Our house looks GREAT! -Courtney S.
Great experience! My home feels new again. Would definitely use again. Thanks guys! -Bryan M.
What a wonderful job Mitchell did beautifying our community after vandals defaced our brick wall and drainage ditch with graffiti! Friendly, totally professional and at a very reasonable price! Highest recommendation! -Russ N.